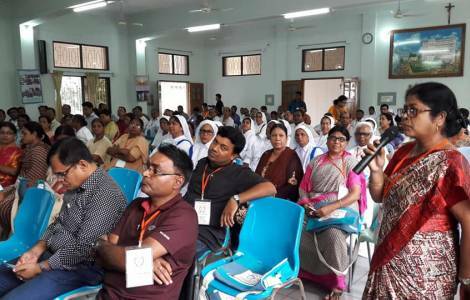 Dhaka (Agenzia FIdes) - "We must pray and commit ourselves in order to ensure that the next general elections are just, peaceful and credible": says Anita Haldar, a Catholic, a social worker who works in the Bengali Catholic community, to Agenzia Fides. "The country will vote in December, everyone is called to pray and contribute to a peaceful electoral process. Past elections were often marked by violence", she notes. The Electoral Commission will announce the program for the upcoming parliamentary elections on 8 November. The 11th round of general elections will probably take place between 20 and 23 December. "The important thing for any party that comes to power, is that it must really work for the people's development, for a sustainable economy, to give job opportunities, to improve education, health, livelihoods and housing programs for those who are not wealthy", Haldar wishes. "All political parties are called to work together, regardless of religious differences, for the common good of the country", she says. Muslims account for about 90% of the population in Bangladesh, where over 160 million people live, with one of the highest densities in the world. The Hindus represent about 8% and the rest of the population profess various faiths, such as Buddhism and Christianity (the faithful are 0.2%, among them 400 thousand are Catholics). There are about three million indigenous people, ethnic minorities besides the majority of Bengali. Bangladesh holds parliamentary elections every five years. In the National Assembly there are 350 seats, 50 reserved for women, but there are no seats reserved for ethnic minorities. Ethnic and religious minorities tend to support the "Awami League", a party of secular inspiration, to oppose the Islamist parties.